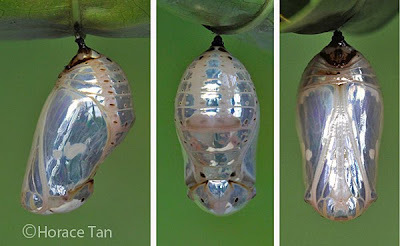 Almost in the blink of an eye, the year 2010 is nearly over. 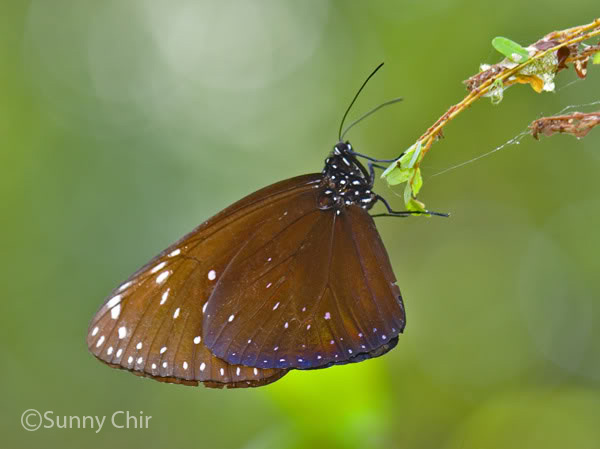 It has been an eventful year for ButterflyCircle, as our online group grows from strength to strength with more new members joining and the standard of butterfly photography reaching new heights. 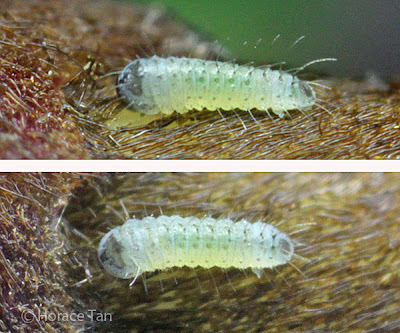 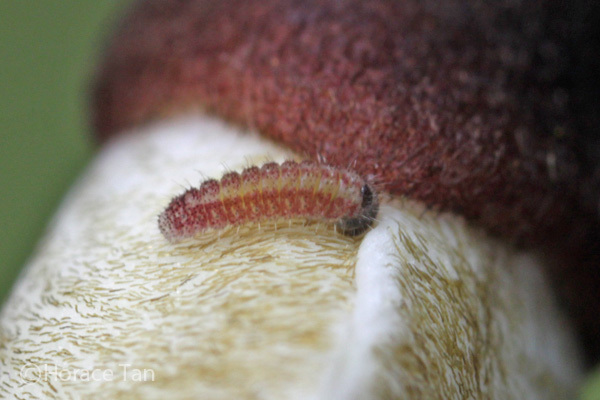 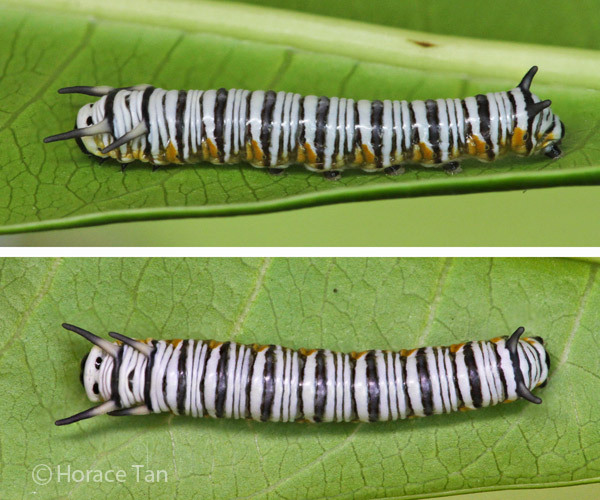 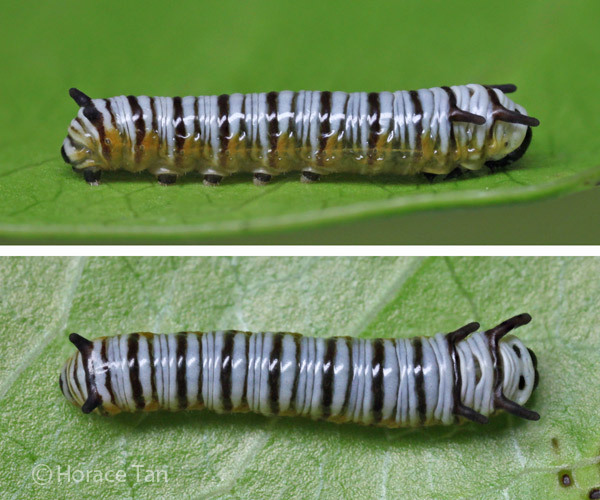 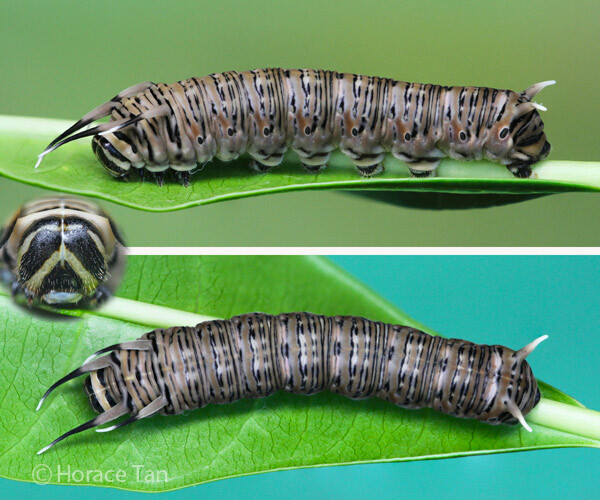 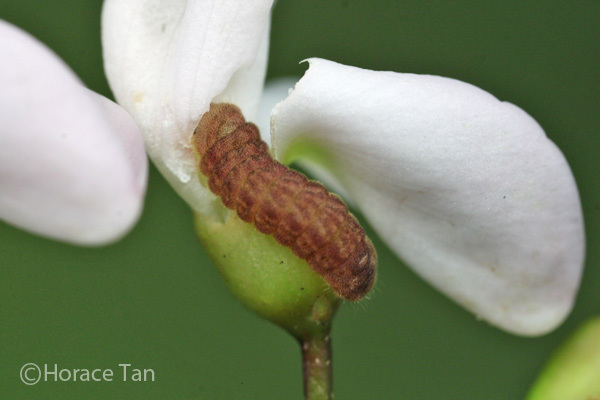 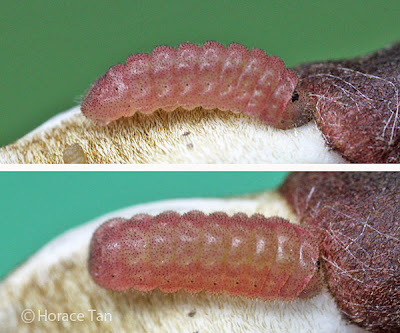 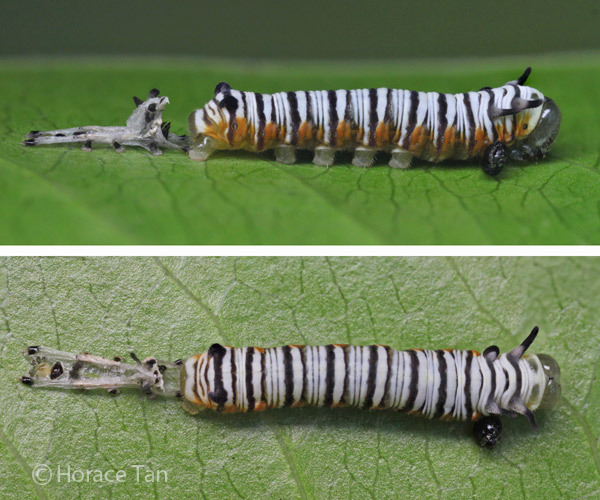 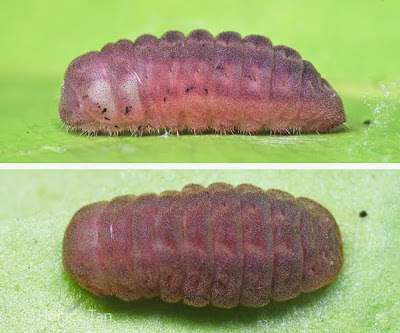 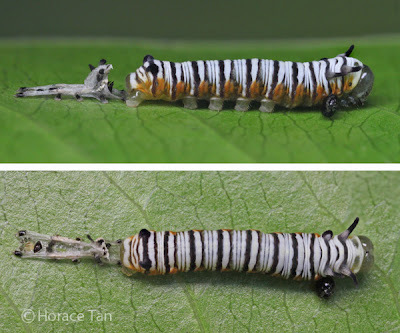 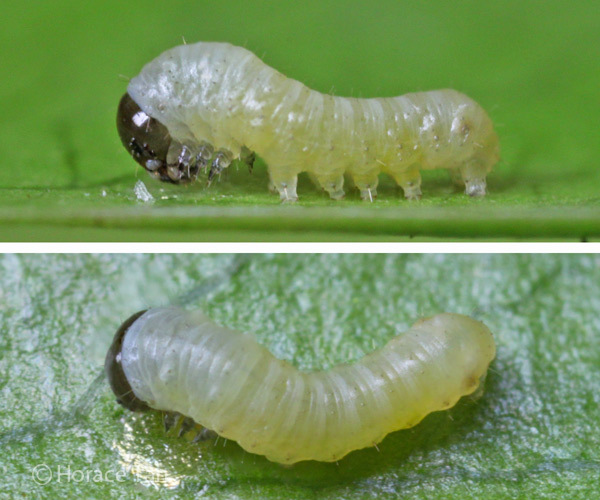 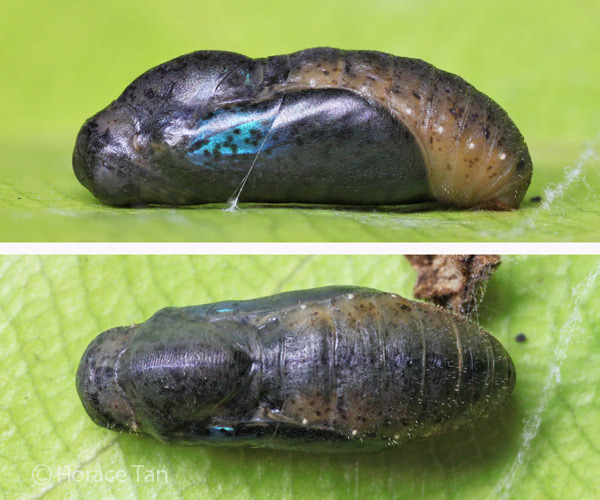 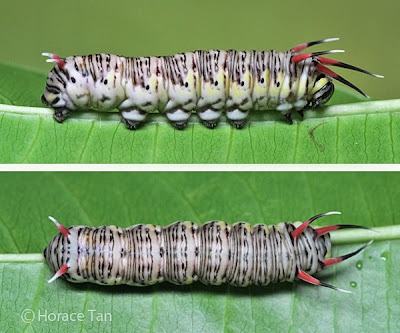 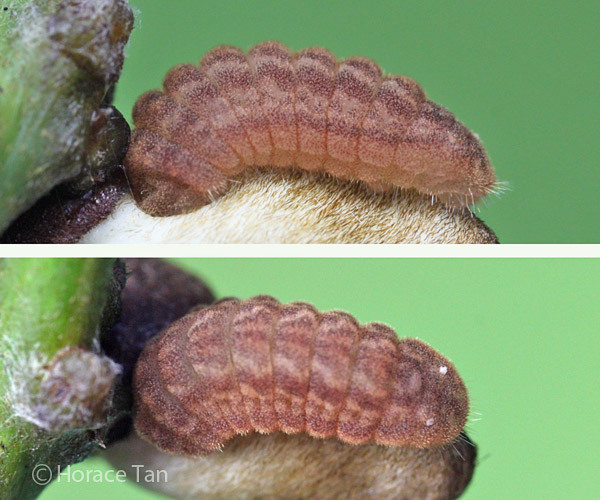 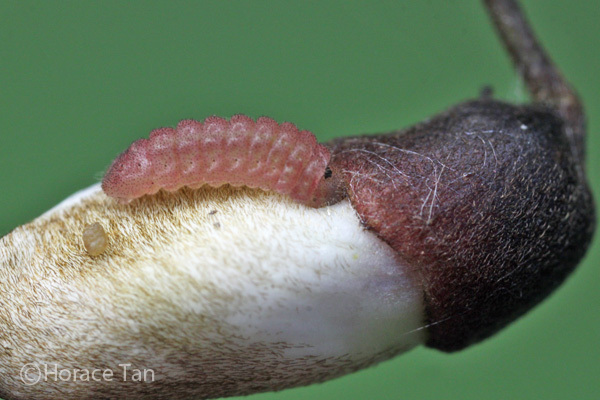 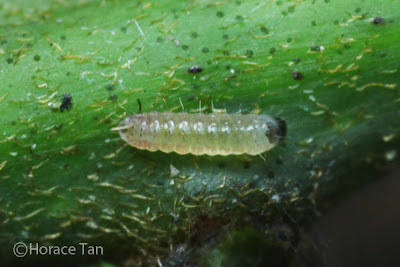 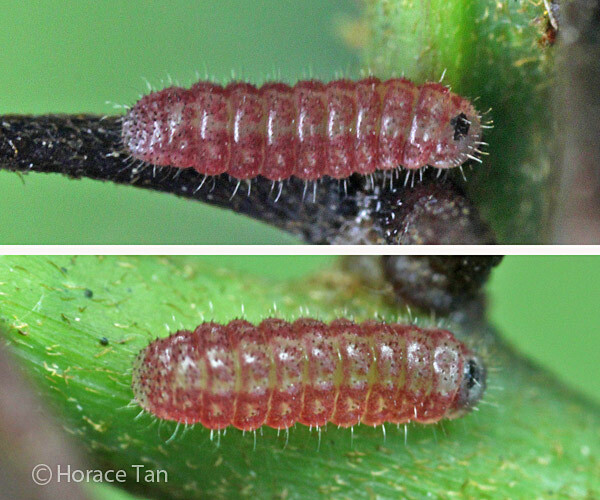 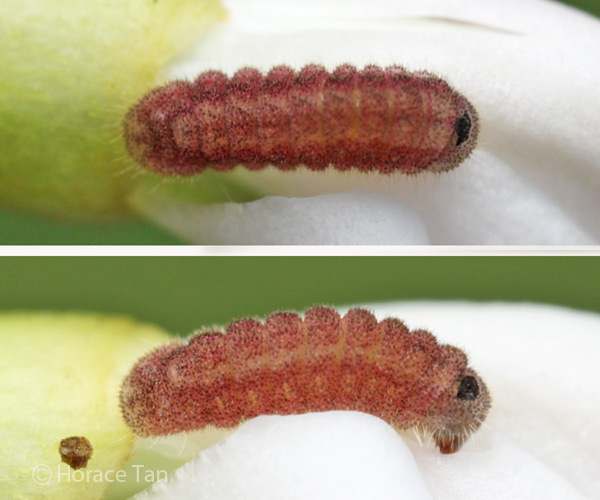 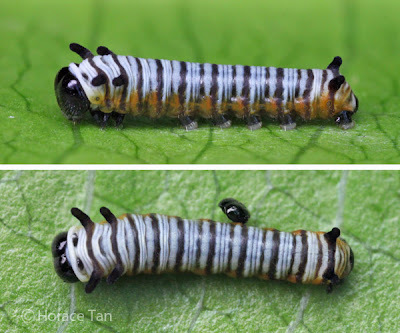 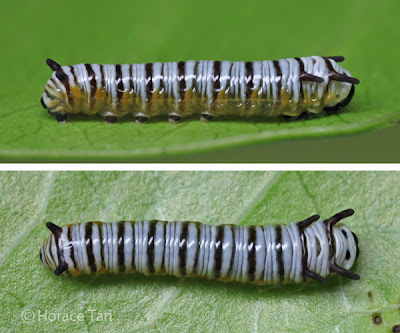 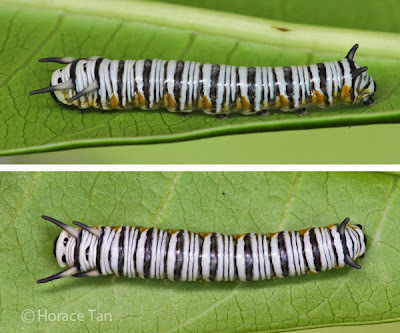 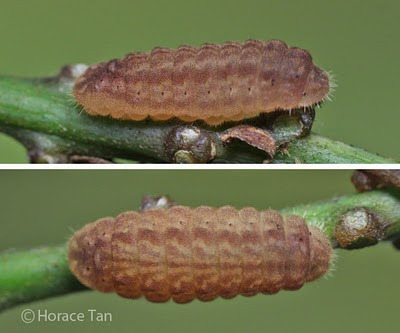 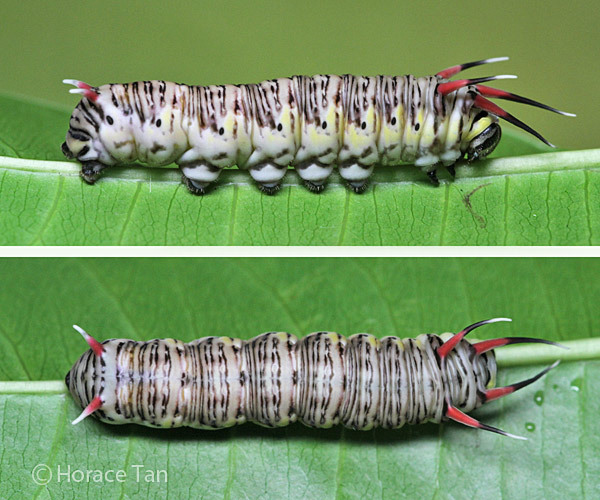 The year saw some new additions to the Singapore checklist, as well as many valuable discoveries on the early stages of various species recorded meticulously by our ever-diligent cat farmer, Horace Tan. 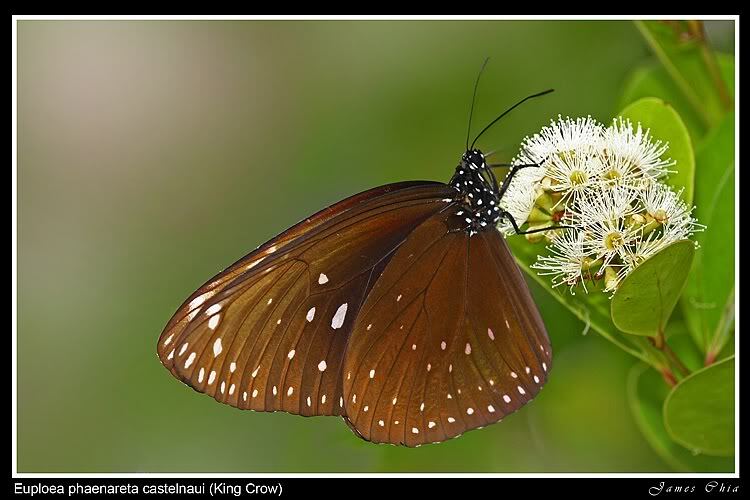 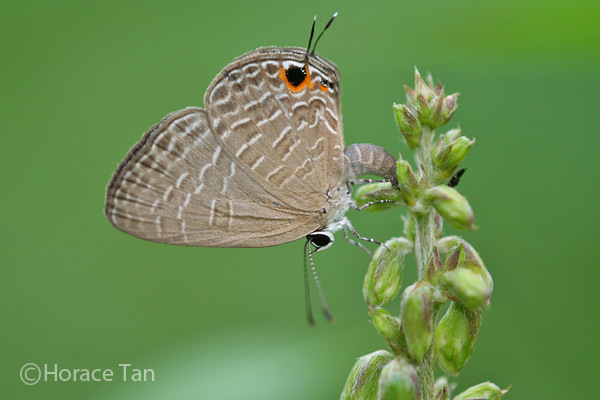 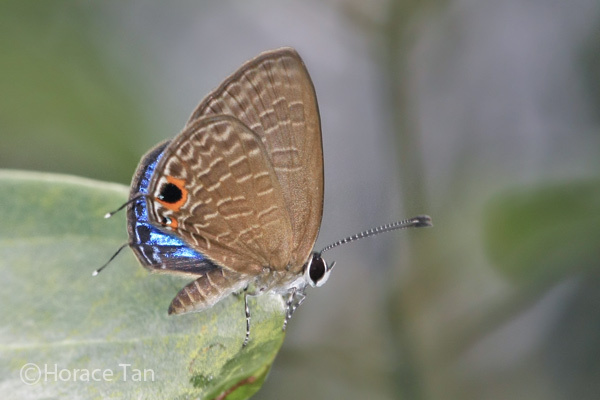 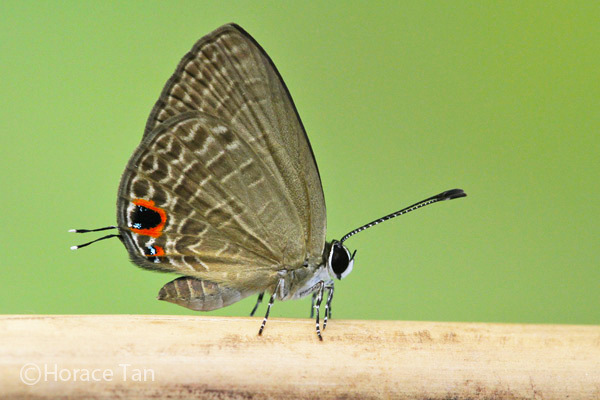 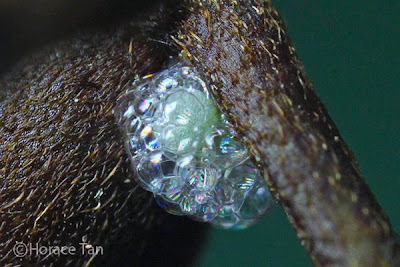 The crowning achievement of the year was the launch of the Field Guide to the Butterflies of Singapore, which saw the combined photographic efforts of nearly 40 members of ButterflyCircle come to fruition in a single book. As we are only a week before Christmas 2010, we in ButterflyCircle would like to take this opportunity to thank our members and readers for being with us all these years. 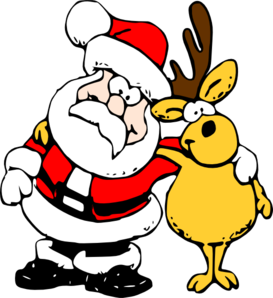 In these turbulent times of global financial crises and terrorists in all shapes and sizes, it is a time to reflect and be thankful for what we've got and to be with our loved ones. Our butterfly of the month for December 2010 is the intrepid Painted Jezebel. 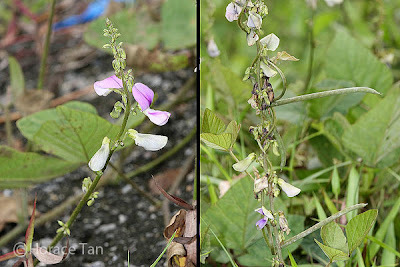 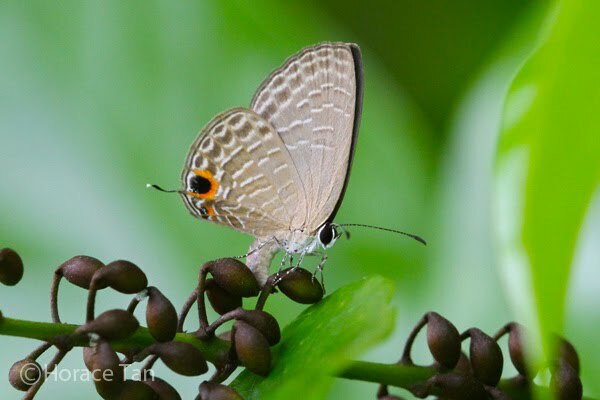 A common urban butterfly, the species appears all over the island, often seen flying restlessly at treetop levels, coming down only to feed on flowering plants or to rest after a long day of flying. 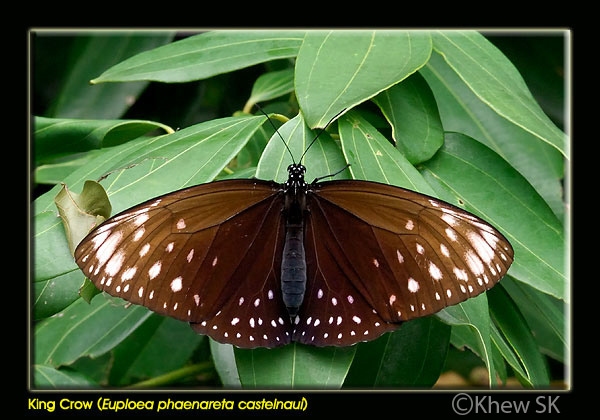 The species displays aposematic colouration i.e. 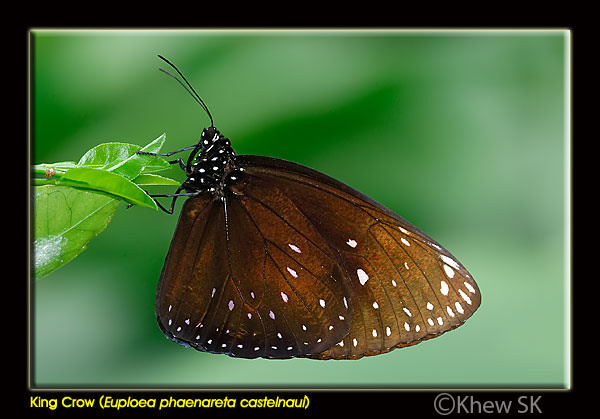 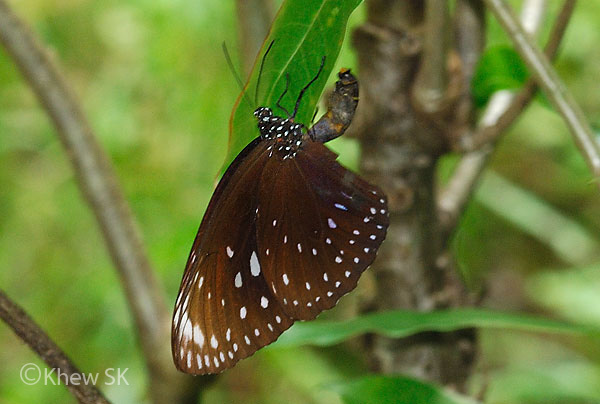 warning colouration that advertises the butterfly's distastefulness to would-be predators. 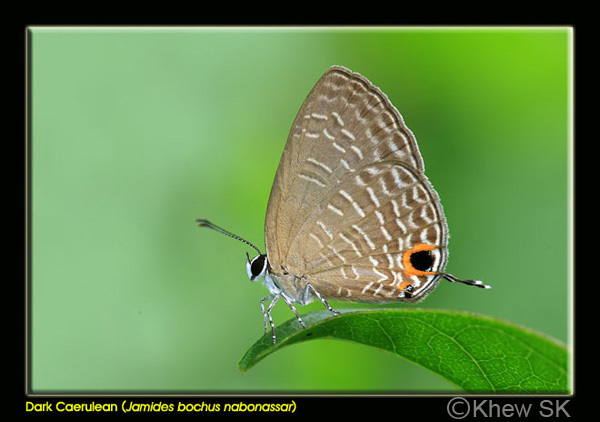 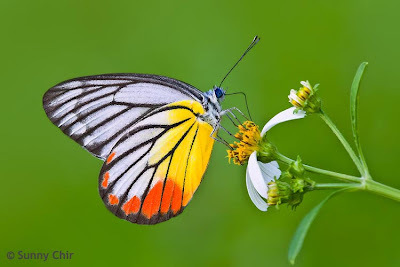 The species belongs to the genus Delias of the Pieridae family, which features some of the most colourful and attractive butterflies in the world. 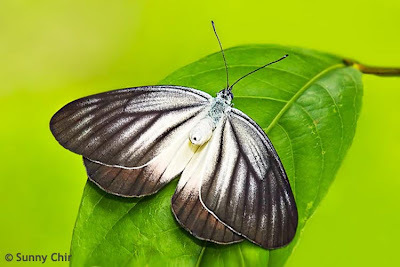 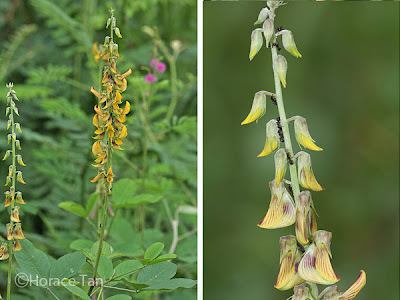 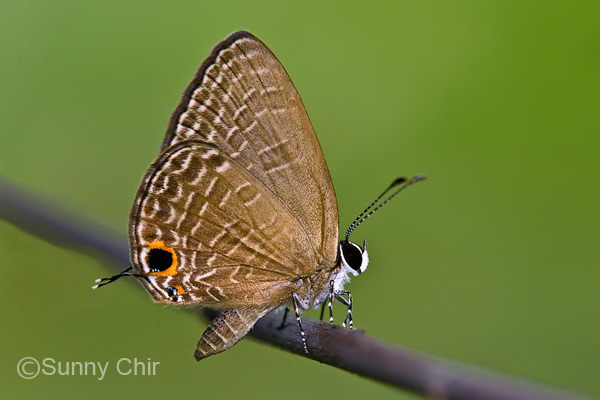 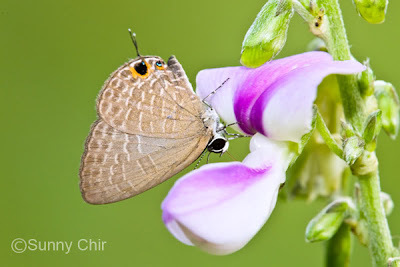 For more information on the genus Delias, do visit the website of one of ButterflyCircle's members, Leslie Day, at the Delias of the World. It is interesting that the English common name of the butterfly takes reference from biblical origins. Historically, Queen Jezebel was the wife of King Ahab of Israel in the mid-ninth century BCE. 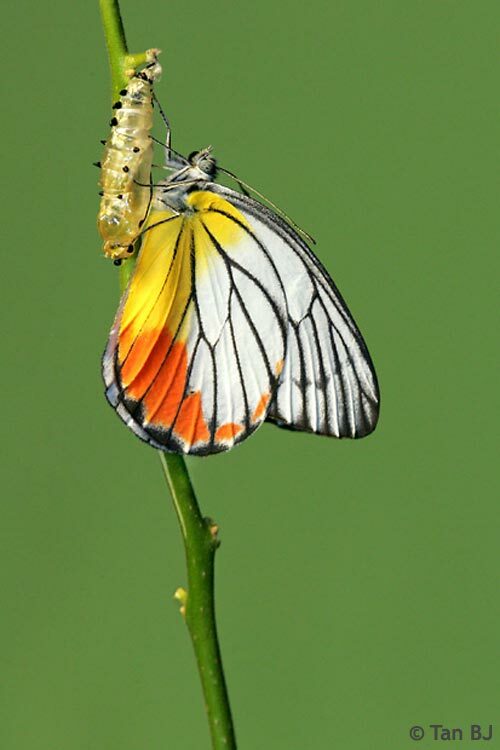 A Phoenician by birth, Queen Jezebel claimed her place on the throne of Israel and solidified a prosperous trade alliance between Israel and Tyre. 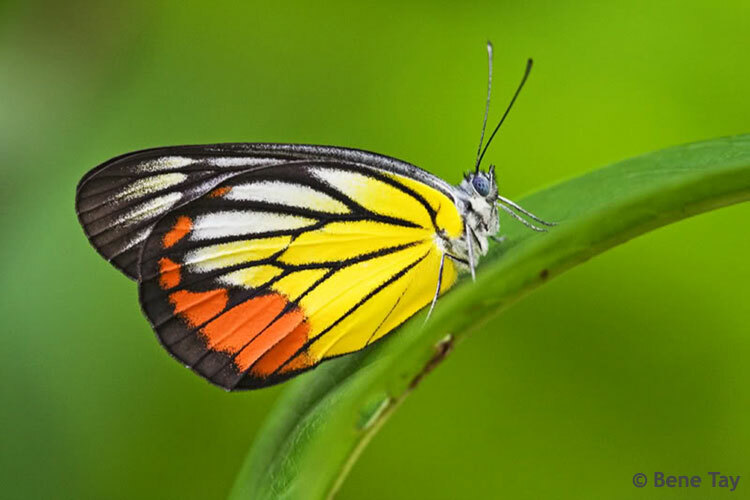 Queen Jezebel's story was tragic, however, as it ended with her murder where she was thrown out of her palace window and her corpse eaten by dogs. 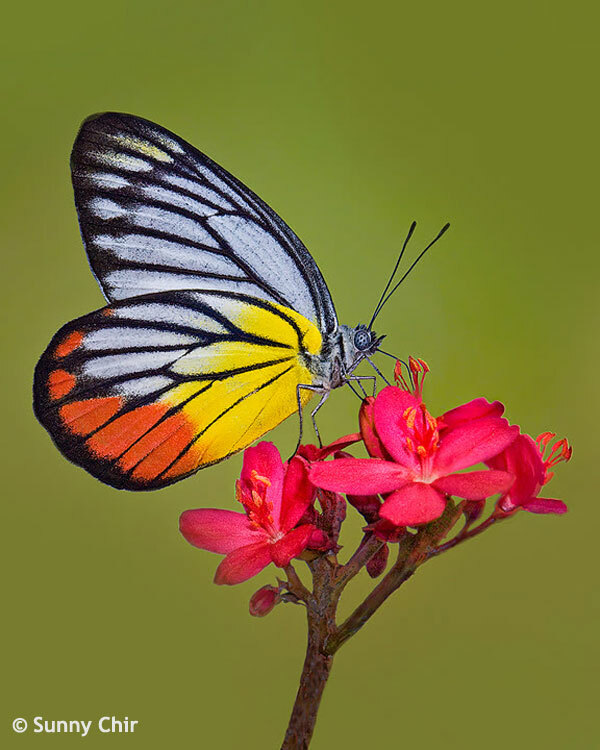 In modern times, the name Jezebel has rather uncomplimentary connotations. 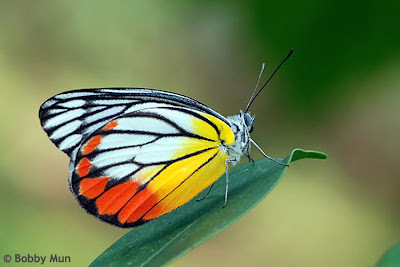 It has come to be associated with women who are sexually agressive, promiscuous, wicked, manipulative and controlling. Such phrases as "painted Jezebel" refer to the scene in 2 Kings 9, in which the vain, elderly queen paints her eyes and does her hair just before being thrown to her death. 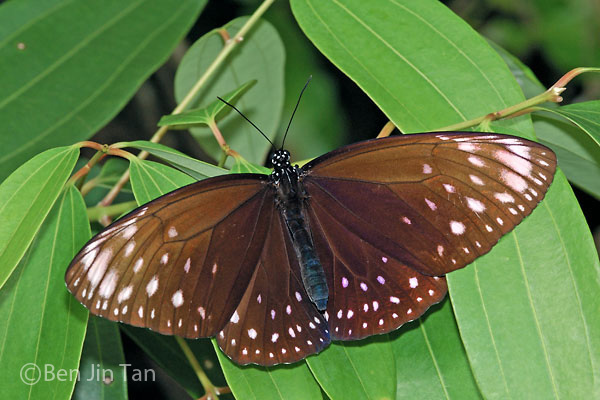 In some contemporary views, her dressing in finery and putting on makeup before her execution led to the association of the use of cosmetics with "painted women" or prostitutes. 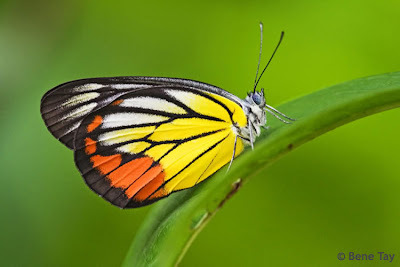 With that little bit of history, we now come back to focus on our little butterfly, which probably does not know (nor care!) 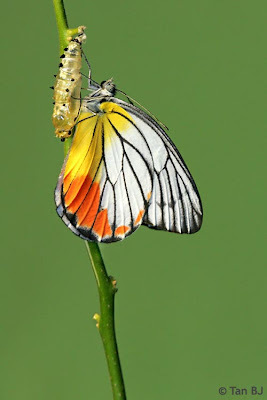 much about its rather dubious pedigree. 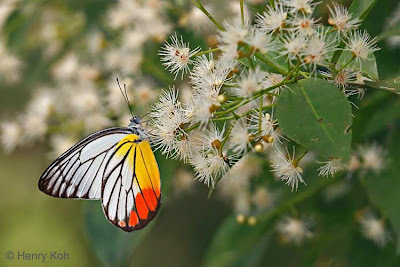 The Painted Jezebel flutters nonchalantly amongst the treetops, never making any attempts to conceal itself as its predominantly white wings can be seen clearly from afar. 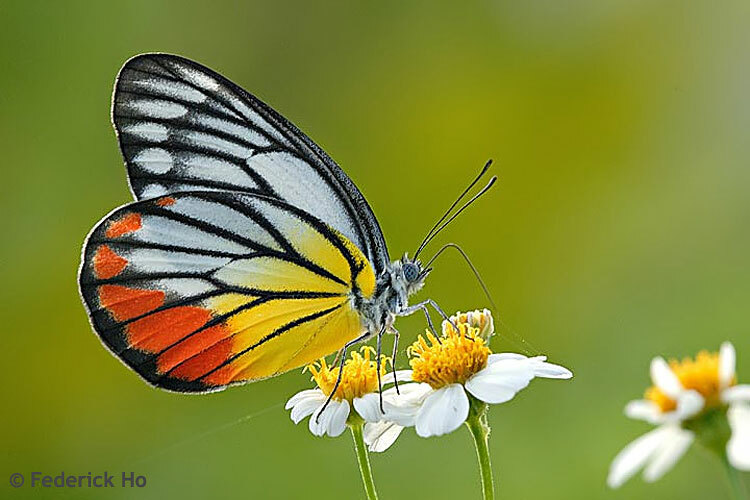 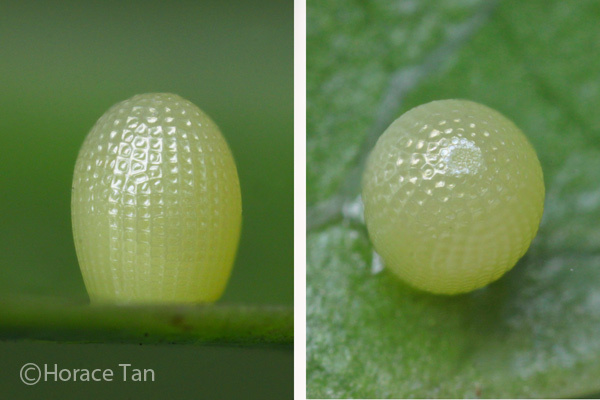 The Painted Jezebel occurs commonly throughout Singapore and is seen in urban areas as well as within forested reserves. It usually flies at treetop level, frolicking amongst the canopies of tall trees. Its restless flight is interrupted only when it descends to feed at flowering shrubs or to rest in the shaded understorey of the forests towards the later part of the day. 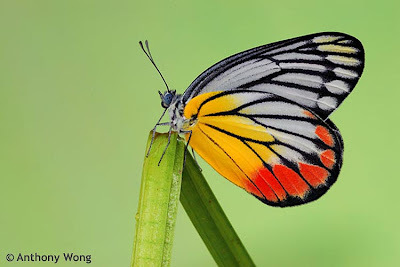 The wings of the Painted Jezebel are white above, with the veins prominently black-dusted in the outer areas. The female is more heavily dusted with black, more so on the upperside than the underside, than the male - appearing almost dark grey when in flight. 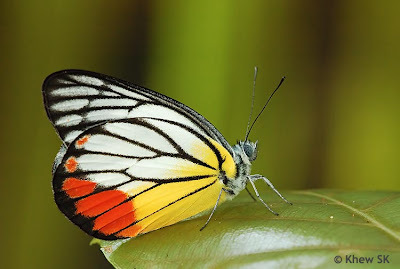 The basal half of the underside of the hindwing is bright yellow with a bright red marginal border and crossed with the contrasting black veins, giving it an attractive and colourful appearance. 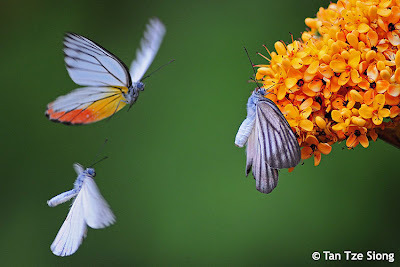 One can often observe the courtship dance between males and females of the species. 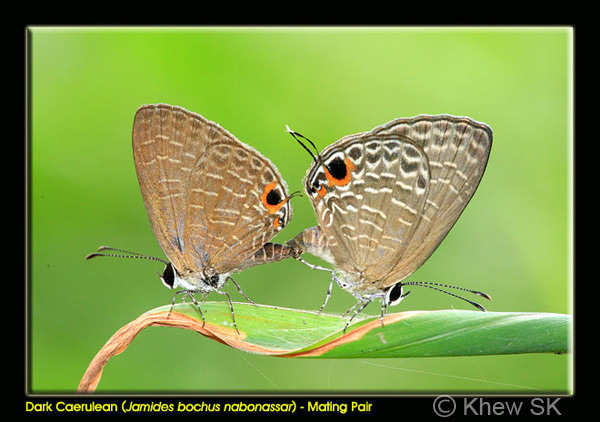 Often, more than one male (I have see up to four!) 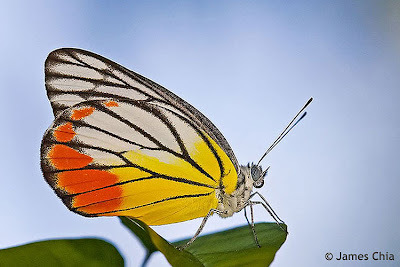 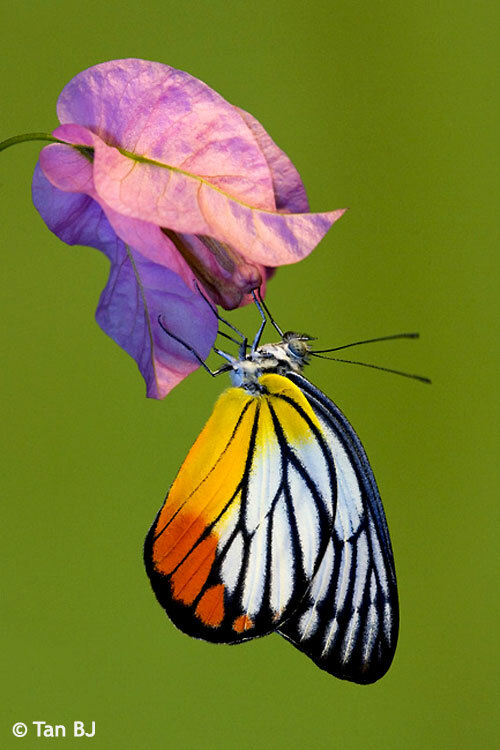 can be seen in pursuit of a female Painted Jezebel. 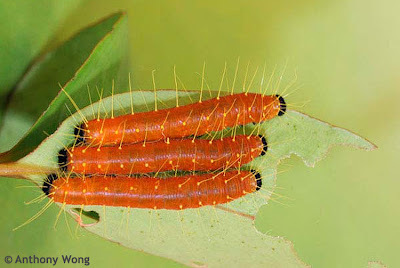 Painted Jezebel caterpillar trio... singing Silent Night this Christmas? 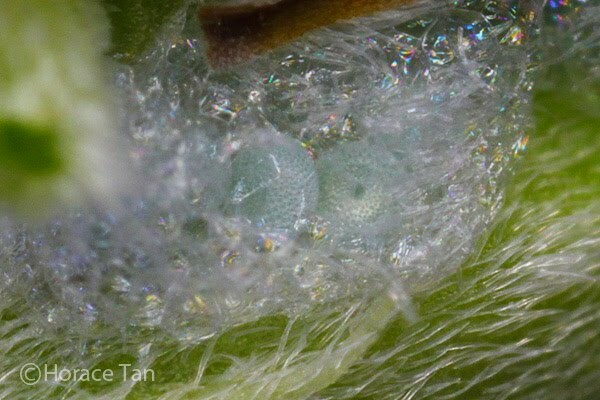 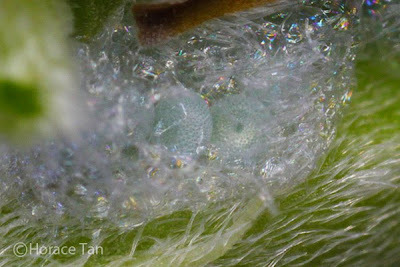 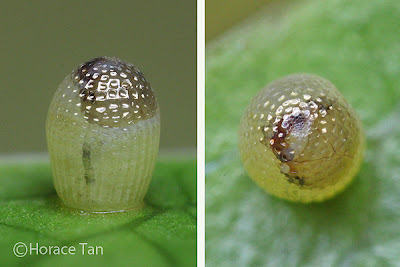 The caterpillars of the Painted Jezebel feed on the plant Dendrophthoe pentandra, a parasite that grows on the branches of other trees and plants. 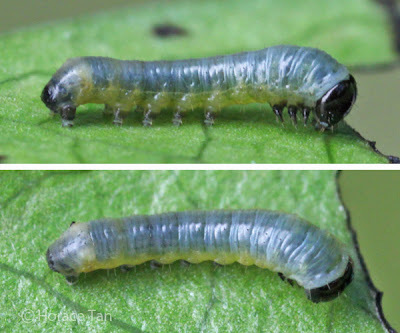 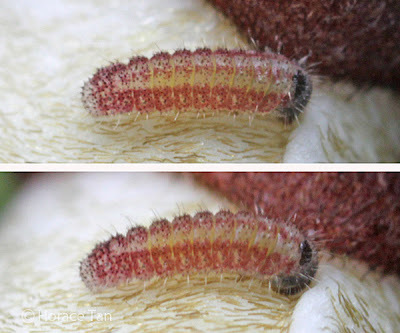 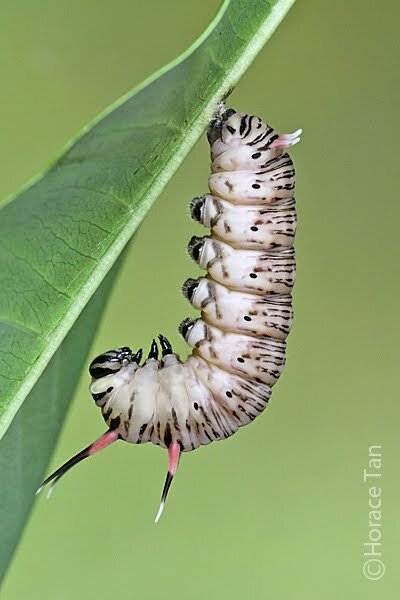 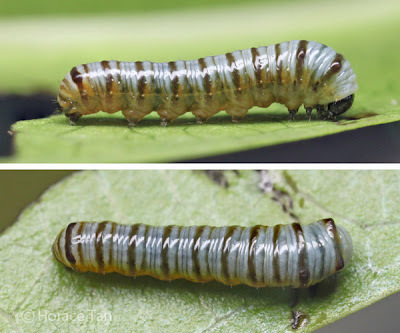 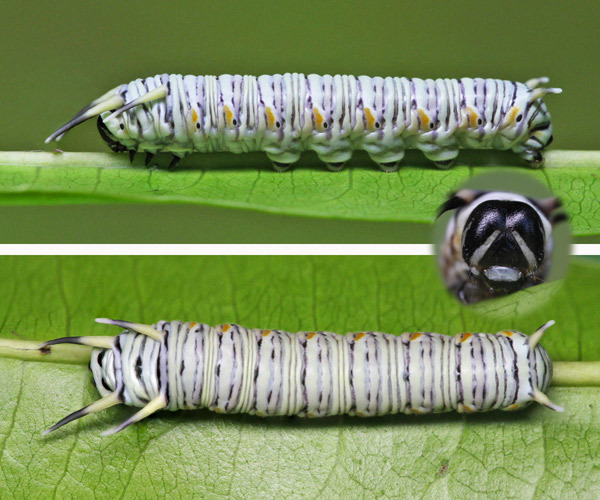 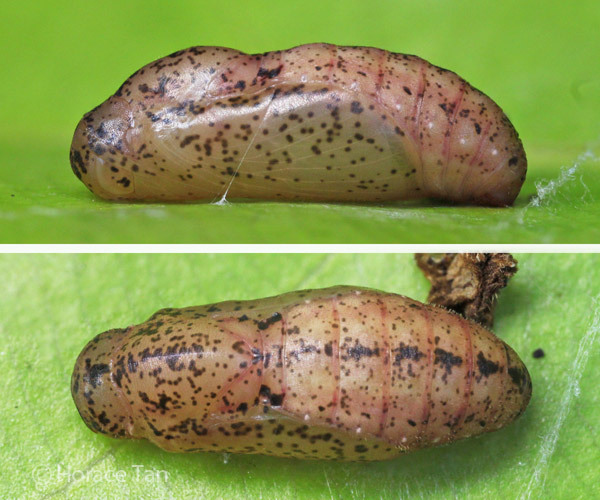 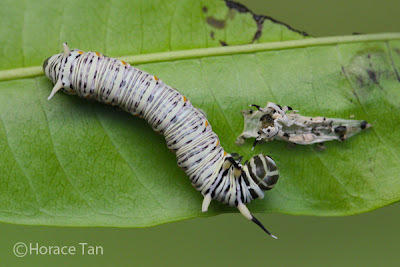 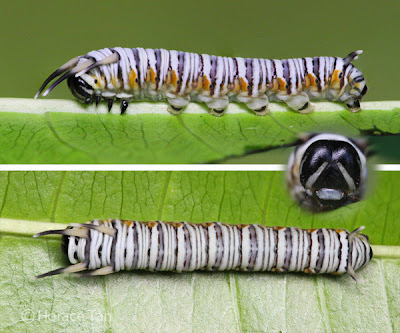 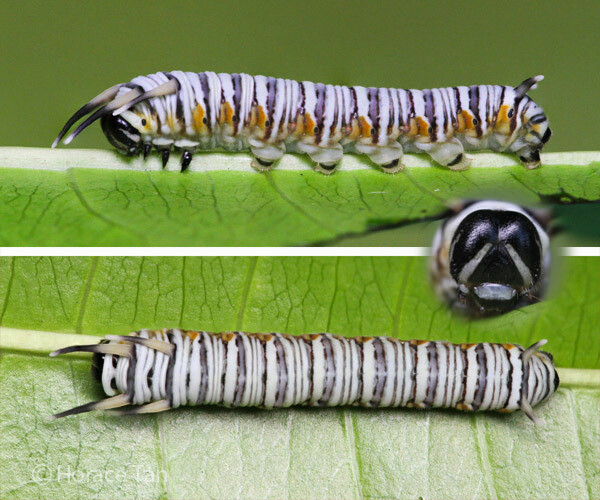 The caterpillars are equally colourful and prominent, and feed gregariously amongst the leaves of its host plant. 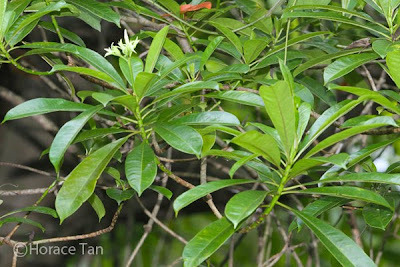 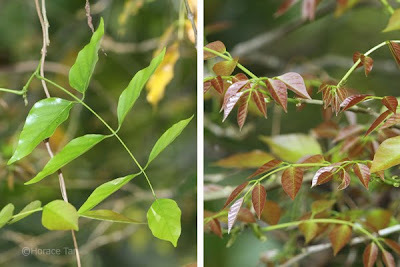 As the seeds of this plant are usually spread by birds, the plant itself can often be seen growing amongst the treetops 3-4 storeys above ground amongst the lofty canopies of large trees. 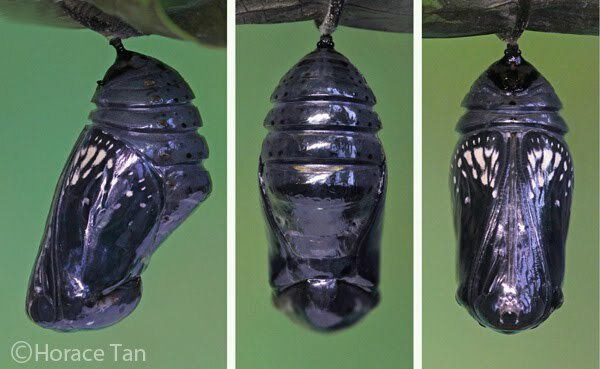 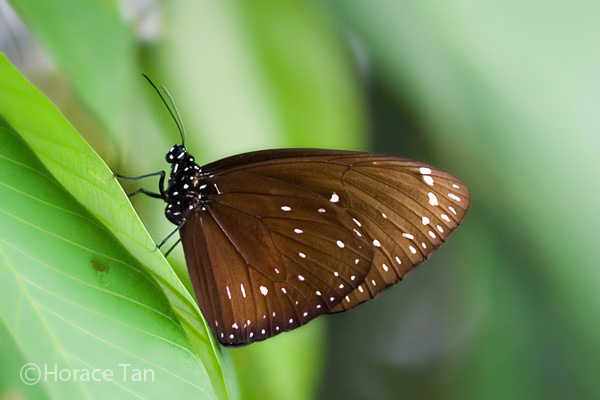 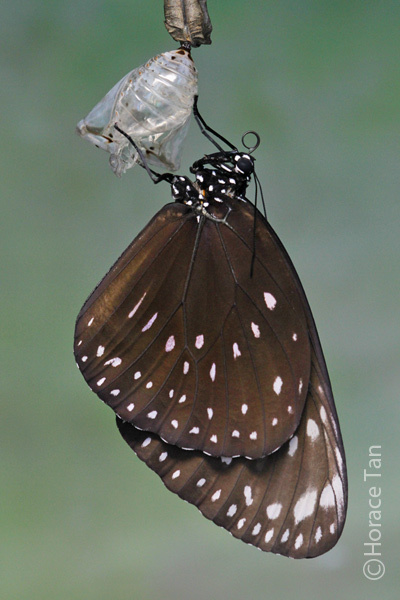 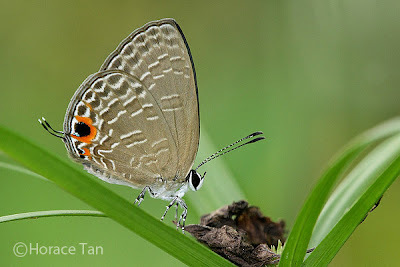 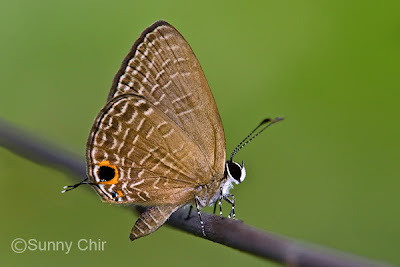 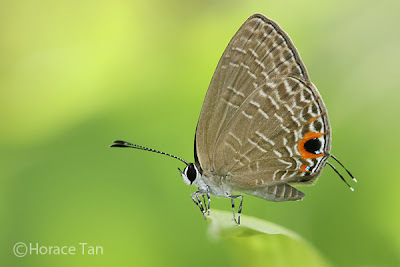 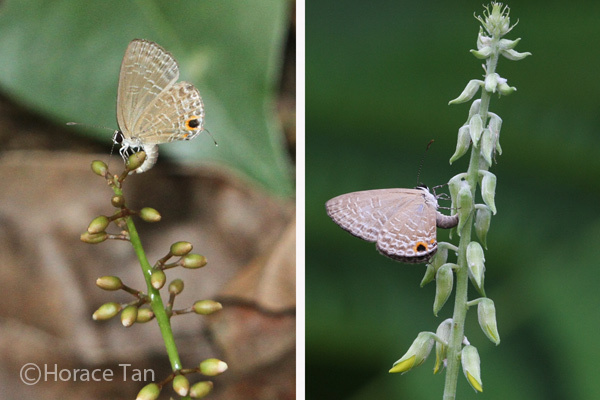 It has been a good year for butterflies, and we look forward to 2011 with great anticipation for more discoveries and new knowledge to share with the nature community in Singapore and the rest of the world.